Successfully Added Digital Voice Recorder with Dual MIC and Telephone Connection to your Shopping Cart. 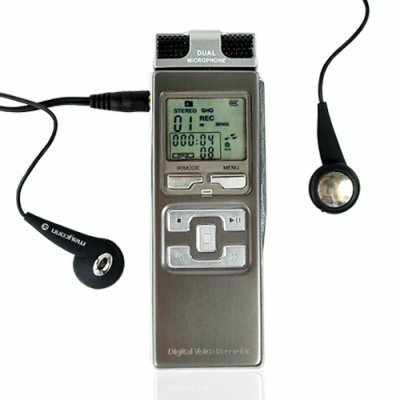 Digital voice recorder with dual MIC and telephone connection for recording those important phone calls. You can use this new product for several applications, whether personal or business, with 4 GBs of flash internal memory you can record up to 66 hours of audio. Finally, no need for pen and paper anymore. This is an amazing handheld portable voice recorder that is just top notch! This voice and telephone recording device fits easily and comfortably in your pocket and is always ready to record. So, never miss an important note or appointment with this great gadget that lets you record memos, speeches, presentations and telephone conversations in crystal clear WAV or ACT format with ease. By using the included telephone attachment you can record telephone conversations or monitor someone's phone conversation. There are 3 different quality recording modes available, along with noise reduction technology. In addition, this handheld portable recorder can also work as an MP3 player, so after those boring lectures you can walk home listening to your favorite tunes. This device would be perfect for those who normally take notes in business meetings, team discussions, lectures and would also be ideal for admin staff and medical personnel, to ensure every detail is captured. I can see the CVFC-G20 voice recording has dual MIC, does that mean it records in stereo? absolutely, this product is designed with dual MIC for clear audio recording . Very nice sound quality. Handy and energy saving-tool. wow guess i get the last one!! excellent product! works wonderfull!! This Digital Recorder records in crystal clear sound at a very nice volume when played back on the device. Works great..highly recommended.